Thieves now using key fob rerouting to steal cars! According to Markham automotive security specialist Jeff Bates, owner of Lockdown Security, wireless key fobs have a role to play in many recent car thefts, with thieves intercepting and rerouting their signals — even from inside homes — to open and steal cars. "We've seen it anecdotally through some of our clients that have come in that have some new vehicles that surprisingly have gotten stolen," he said. Bates said the spike is so great, a local Toronto car dealership selling new Lexus vehicles asked his company to install tracking systems on all high-end SUVs because so many of their vehicles are being stolen. One of his customers, who came from the dealership, had his car stolen three times by thieves rerouting the key-fob signal, according to Bates. The increased need for Bates's security services comes as police are seeing a spike in auto thefts across the GTA. In Toronto, they're up 30 per cent compared to this time last year. The Toronto Police Service couldn't provide a representative to speak about the rise, but told CBC Toronto they'll hold a news conference on high-end vehicle thefts this week. In Durham, auto thefts are up 16 per cent this year, and in Halton, there have been 517 cases so far this year, compared to 490 in total last year. 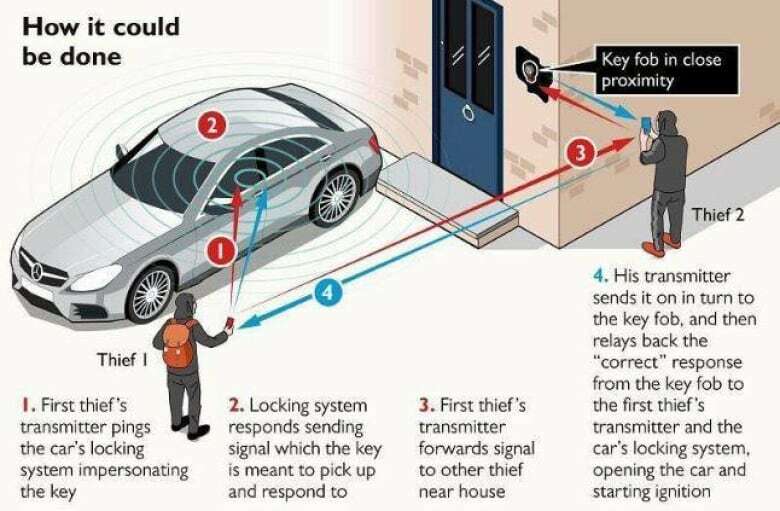 According to Bates, many of these thieves are using a method called "relay theft." Many people don't realize it, Bates said, but the thieves don't need the fob in the car to drive it away. "The vehicle will continue running in perpetuity until it runs out of gas or until you shut it down," he said. "They do that for safety so that if you lose the key fob or if it loses signal the vehicle doesn't shut down while you're driving, but that right there is part of the vulnerability." Panchal said he isn't sure thieves used this method to take his car, but he didn't see any signs of forced entry after it was recovered. "It's pretty insane just to think about something like that even happening. I guess that's what they're doing these days, right? If that's what they can do, that's what they will do." Earlier this year, an Oakville, Ont., man caught his alleged thief on-camera seemingly using the relay theft method. According to Bates, the automotive industry made a trade-off when it started creating push-start fobs, putting convenience ahead of security. Some manufacturers are working to fix the fob vulnerabilities, but there are ways vehicle owners can protect themselves. The first tip, Bates said, is to not keep your keys by the front door. "If you do live in a house, try to leave your keys either upstairs or … as far away from the vehicle as possible," he said. "The other thing that you can do is there are products out there that you can put your key fob into," such as a faraday cage — a box used to block radio signals — a key pouch, which works similarly, or even a steel box. Bates said it's important to look at solutions, considering more and more vehicles are being equipped with remote start fobs. "I think it's going to continue to happen and I don't think we've seen the end of it. I think it's going to be even more and more prevalent." You don't have to re-route, you just need an extender to pickup the signal and make the car think the key is closer than it is. Maybe article is saying the same thing, but they're trying to make it sound more complicated than it really is. People get pissed when their car is stolen but don't revolt,while knowing all the time their data can be stolen by hackers,social media,making money on that data. Do they care about how much intrusion their Two Party govt. has in their lives? They love the same technology that is screwing them around. Hope everyone has "Dying Dumb" on their bucket list. Technology will continue to improve: someday hackers will cause Autopilot to deliver your Tesla from your driveway to their chop shop. That way they don't have to travel to your house and risk a fatal confrontation, and you don't have to risk getting killed in a grand theft auto. "It's a win-win." Or when you fail to vote for globalists, or publicly criticize Islam, your car will simply lock you in and deliver you to your execution place.